"Our plant has been having problems with solid contaminants in our hydraulic oil, so I am looking for a good technology to filter the oil. We are already using oil filters, but do you know of any other technologies that could possibly help?" Particle filtration of a hydraulic system is usually sufficient for controlling the level of oil contaminants. However, sometimes "cutting corners" occurs during the system's engineering process, which can lead to inefficient filtration. Cleansing the oil of contaminants is generally considered to be secondary to the primary functions of the hydraulic system and thus is often neglected and underemphasized as a vital part of the design. This can result in filters performing poorly due to lacking structural integrity, dirt-holding capacity or particle-capture efficiency. There are also many ways in which the system could be inadequate for performing filtration, including its flow rate, the presence of vibration or if the overall differential pressure is lost because of the filter's location within the system. Each of these factors must be considered for the filtration system to work effectively. Of course, filtration is only half of the equation. Contamination control involves not just removing particles but also keeping them from entering the system. If more particles are coming into the system from ingression points like breather points, hatches and seals than being removed, the system will never be clean. Therefore, you must have a balance of contaminant exclusion and contaminant removal methods. 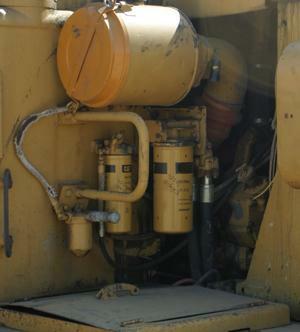 If an alternative approach is needed to remove contaminants from the hydraulic oil, technologies such as centrifugation, magnetic filtration or a combination of periodic, portable filtration systems may be implemented. Although filters can be very efficient, sometimes they are not enough and must be complemented with other methods to remove the finer particles. For instance, with magnetic filtration, ferromagnetic particles can be captured regardless of their size. These types of particles often make up nearly 90 percent of particles suspended in oil. Centrifuges also offer advantages over traditional filter media. The efficiency of a centrifuge is consistent throughout its service, and the lower limit of its particle size trapping capability can be much less than 1 micron. While several other technologies are available to enhance the abilities of a typical oil filter, the best advice would be to thoroughly evaluate the filter system currently installed and then develop a plan of action based on the findings.